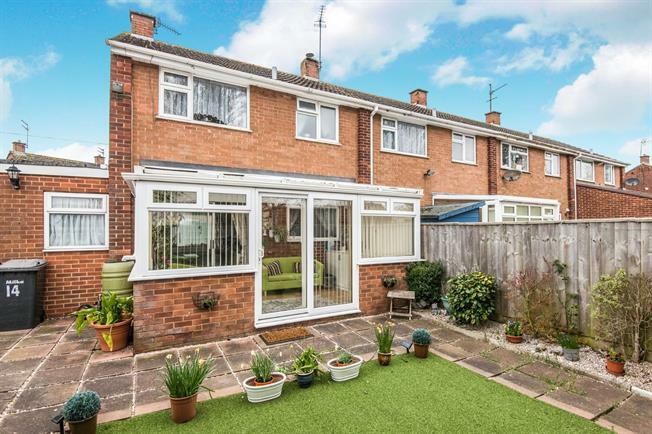 3 Bedroom End of Terrace House For Sale in Exeter for Offers in excess of £245,000. An early viewing is highly recommended to make the most of this property. Accommodation to the ground floor comprises kitchen, a large lounge/dining area, conservatory to the rear and downstairs shower room. To the first floor you will find three bedrooms and a family bathroom. The property is presented to a good standard through out and benefits from UPVC double glazing and gas central heating. To the rear of the house you will find a fully enclosed garden laid to artificial grass. A white and modern three piece suite comprising pedestal hand wash basin, low level WC and shower cubicle. Carpeted flooring, tiled surround. Heated towel rail. UPVC obscure double glazed window to the front aspect. UPVC double glazed windows to the front and side aspects. UPVC double glazed doors providing direct access on to the rear garden. Wood effect laminate flooring. Base unit and roll top work surface provides space and plumbing for washing machine, tumble drier and freezer. A range of matching wall and base units with a roll top work surface and tiled splash backs. Four ring gas hob with extractor over. Stainless steel sink with mixer taps over. UPVC double glazed window to the rear aspect. Integrated double over. Space for fridge and slim line dishwasher. Wood effect laminate flooring. A white three piece suite comprising pannelled bath with shower over, pedestal hand wash basin and low level WC. UPVC obscure double glazed window to the rear aspect, carpeted flooring, radiator. Part tiled surround. UPVC double glazed window to the front aspect, carpeted flooring, radiator. Built in wardrobe. To the rear of the property you will find a fully enclosed garden laid mainly to artificial grass. This is the perfect area for alfresco dining during the summer months. The garden provides space for a garden shed as well as rear access.